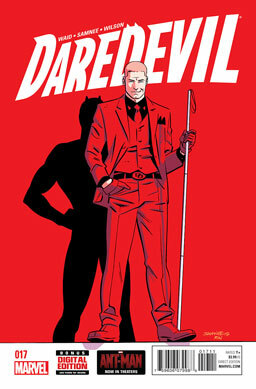 The Kingpin has double-crossed Matt Murdock pretty hard. He’s had Ikari, the assassin with all of Daredevil’s fighting skills and enhanced senses — plus the ability to see — to kidnap Foggy Nelson and Kirsten McDuffie. He wants Matt to fight Ikari — and if Matt wins, he’s going to kill either Foggy or Kirsten. Can Matt devise a plan to save both his friends? And can that plan survive when the always-meddling Shroud decides he wants to help? Verdict: Thumbs up. 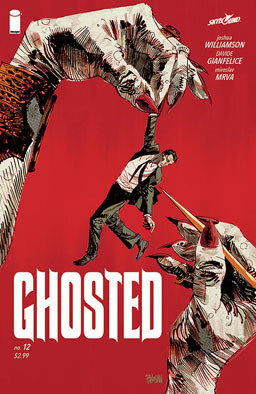 Great art, great story and cliffhanger. Great to see Ikari and the Kingpin here up to their old rotten tricks. Sonja is hired by a group of nuns to protect their citadel, a gigantic library that the local empress wants destroyed, mostly for the sake of evil. But there’s a problem — Sonja never learned to read, doesn’t value books, and is unwilling to risk her neck just for a bunch of paper. But she later has a change of heart and returns in time to run off the soldiers of the empire — but not before they inflict a possibly fatal wound on the nuns’ leader and attracts the wrath of the corrupt empress herself. Verdict: Thumbs up. 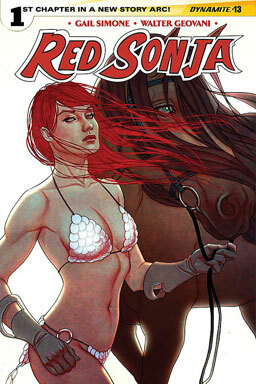 I’d been worried that Gail Simone was off this comic, but yay, she’s still writing it! 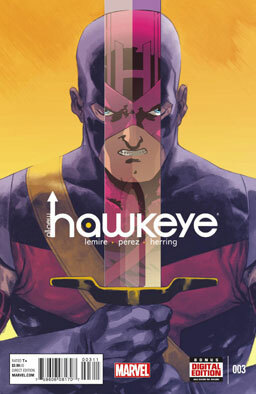 Characterization and humor are still strong points of this series, along with the ridiculous depravity of the villains. Verdict: Thumbs up. Quite a cliffhanger at the end there! Here’s an outstanding profile of sci-fi grandmaster Samuel Delany. The Chap Olympiad, celebrating the silly traditions of British Gentlemanhood, looks like a lot of fun. Key and Peele bring us a report from inside the very best alternate universe. Sonja has died — or almost so — and meets Death herself, who looks a lot like Sonja, actually. Death wants her on her honor guard, but Sonja has never been one to serve anyone, and she’d much rather try her luck at killing Death herself. 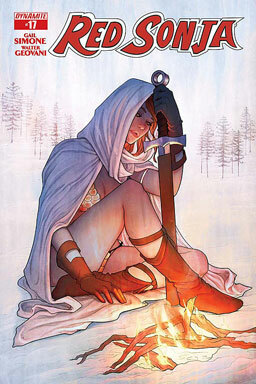 Meanwhile, back in the real world, the townspeople are tending to Sonja, trying to figure out a way to cure her, when she gets unexpected visitors — the great artisans she’d collected in a previous storyarc: Gribaldi the chef, Aneva the courtesan, Rat the beast-tamer, Osric the swordsman, Plaitius the soothsayer, and Rakaua the dancer. And then more visitors: from the very first storyarc in Gail Simone’s run on this title, Ayla, Nias, and Dark Annisia, resurrected with the aid of an alchemist’s potion. 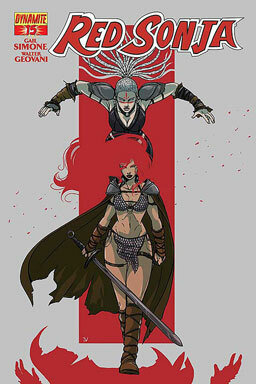 Can Sonja defeat Death? Can Sonja be brought back from the brink of death? Verdict: Thumbs up. 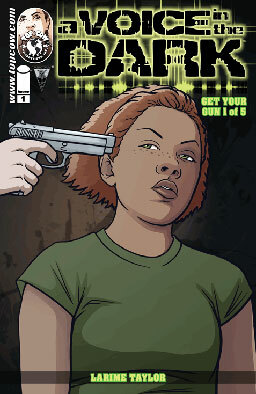 This may be Simone’s final issue on this series — it’s certainly written like a final issue. If it’s not the last one, Simone is leaving herself a big hurdle to top this one. It’s hard to get much more epic than a duel with Death and a reunion with all your friends. 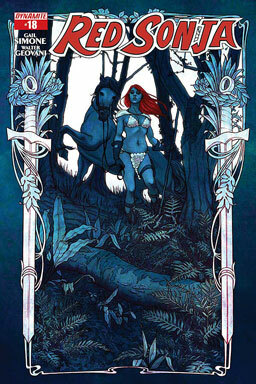 Great story, great art — more evidence that this has been a thoroughly glorious fantasy series. The mad sun has thrown Morpheus into a black hole — where not even he may be able to escape. He gets a brief respite when his mother pulls him out for a chat, but while he wants to save the universe, she only wants to manipulate him into staying with her forever — and when he refuses, she drops him back into the black hole. But then he’s re-rescued by Destiny, who’s frustrated that there’s a ship in the middle of his garden — and it’s clearly been built by Dream, even though Dream has no memory of creating it. And the cat version of Dream has been keeping busy by traveling to the worlds being destroyed by the mad stars and rescuing people. Verdict: Thumbs up. Not a lot of it makes sense yet — hopefully, that will come in the final issue — but the story is told with a great deal of style with a lot of gorgeous art by J.H. Williams III. Kate Bishop and Clint Barton are aboard a S.H.I.E.L.D. helicarrier waiting to find out what the spy agency is going to do with the mutant kids they rescued from A.I.M. Maria Hill strongly hints to them that they should do something to extract the kids from S.H.I.E.L.D.’s care before they’re used as weapons. After a few pages of whuppin’ and a ride out of the helicarrier on a flying car, they get the kids home — but how long will they be allowed to keep mutant super-psychic kids? Verdict: Thumbs up. 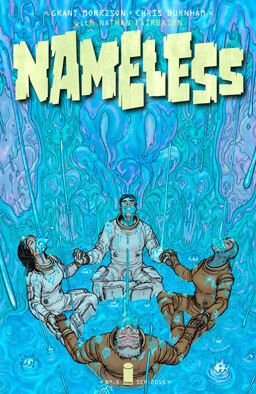 Great art and a nice story. A nice storytelling gimmick, too, with the pastel watercolor story of young Clint and Barney’s trip to the circus told along the bottom of each page. A very long but extremely fascinating look at Russia’s secret troll agency and their many schemes and dirty tricks. This short silent story has a great, funny twist on the Superman-Wonder Woman romance. The world’s largest whoopie cushion — and the cat who must endure the indignity of it all. 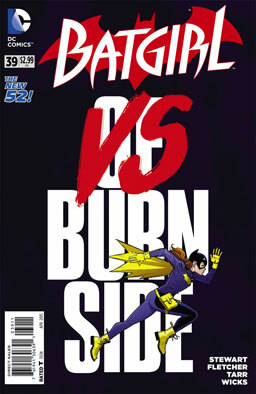 Even for a comic that tends to produce uncommonly interesting stories, this issue probably tops the list. The Goon has learned that a rival mobster has sent a couple mooks to kill him, so he heads for the local bus station so he’ll be there to wipe ’em out. But he’s got a few hours to kill, so he buys a paperback copy of “The Island of Dr. Moreau” by H.G. Wells to read while he waits. And most of the rest of this issue is Eric Powell’s comic adaptation of the classic sci-fi novel. 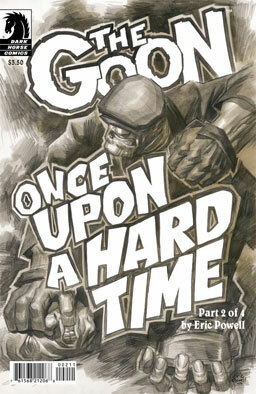 So is the Goon more animal than man now? Will he have the chance to walk back to his own humanity? Verdict: Thumbs up. It’s an amazingly cool storytelling choice, and I get the impression that Powell has always wanted to adapt “The Island of Dr. Moreau.” You should go pick it up for that reason alone. 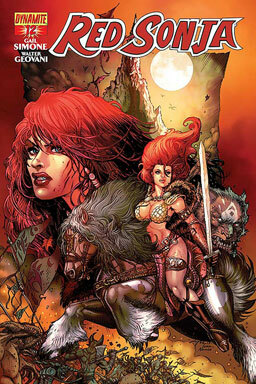 Sonja has returned to the village where she was cursed to never be able to forgive anyone, and she’s figured out a unique method to make sure her supernatural vengefulness doesn’t harm anyone — she’s mutilated her hands into bloody, shattered wrecks so that she can no longer hold a sword. Unfortunately, just as she finally breaks the curse, the wizard who’s been stalking her finally catches up to her. Is there any way for her to stop the sorcerer and his horde of monstrous snakes? Verdict: Thumbs up. Beautiful artwork and beautiful storytelling. The action and tension are excellent, too. It’s the next to the last issue of Gail Simone’s epic run on this series, and I’m dying to find out how she’s going to end it. Here’s a fantastic article about geek culture, capitalism, tribalism, and gay (and other human) rights. An excellent long read about the importance of teaching evolution as the foundation of biology. Everyone always seems to forget that Patrick Stewart is an amazingly skilled comic actor, but his new series looks like it was designed to showcase his comedy chops. 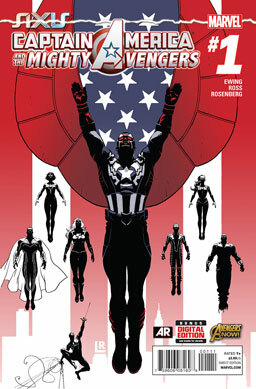 First things first: Ladies and gentlemen, that is just about the worst comic book cover I’ve seen this year. Maybe all of last year, too. 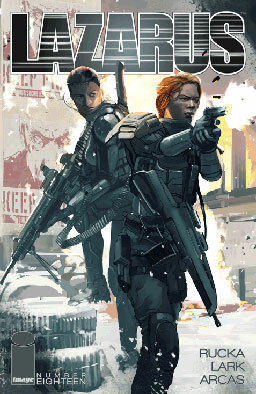 It’s a terrible, muddy, over-chaotic muddle with a style entirely different from the art between the covers. Now that that’s out of the way — forget the cover. What we’ve got inside is a just plain wonderful comic book. Or rather, what we’ve got inside is a pretty typical comic — until the last page happens. 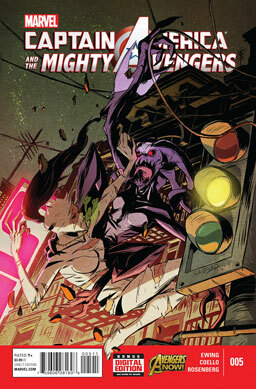 While Monica Rambeau experiments with her light powers by adopting the form of the Blue Marvel — in the altogether, as they say in the hipster circles — Dr. Positron, the Marvel’s mad scientist son, shows up for a short brawl with the Marvel, Monica, and Spider-Man before revealing that he’s found his brother in the Neutral Zone, but he’ll need help to get him out. Elsewhere, Power Man and White Tiger go hunting for whoever killed Gideon Mace and run into way more trouble than they can handle. And Luke Cage and Jessica Jones have a meeting with Jason Quantrell, sinister CEO of Cortex Incorporated — and we learn who’s really behind Quantrell’s diabolic grin. Verdict: Thumbs up. No spoilers, folks, but no kidding, when I read the last page of this one, I sat there in Flabbergasted Jawdrop Mode for at least 30 seconds. I don’t know if they can follow up with the promise of that last page, but I’m really looking forward to the next issue now. 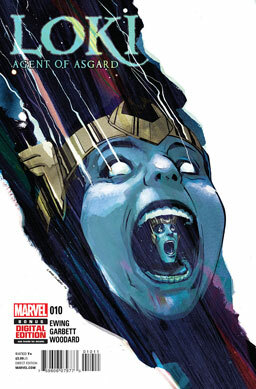 Well, it’s not really the 100th issue of this series, but they figure they’ve got the 100th issue to feature Sonja. Sounds iffy to me, but it makes a decent anthology comic. 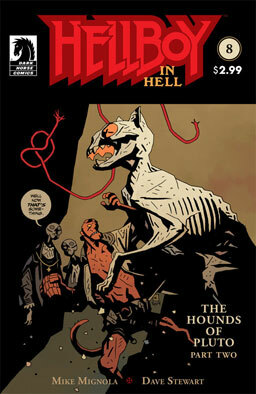 We’ve got creators ranging from Gail Simone to Roy Thomas to Michael Avon Oeming and many more. We get Sonja facing off against spider demons and mutated Rapunzels, we get Sonja taking on an unexpected assistant in a battle against a monster, and we get Sonja meeting one of her own heroes and earning a few wishes. Verdict: Thumbs up. An incredible variety of stories offered here — some classic hack-and-slash battles, some more introspective stories, and all of them excellent reads. It’s especially wonderful to see a story by Roy Thomas, Sonja’s creator. All of a sudden, everyone in Burnside is after Batgirl — whoever’s running the Hooq app is offering $20 million for her capture, dead or alive. And Barbara is being plagued by weird memory troubles, too. She enlists the aid of Black Canary, then realizes that her brain scan is part of Hooq’s programming — is Batgirl trying to kill herself? Verdict: Thumbs up. Nice art and a much more relateable story. This comic’s emphasis on social media and smartphone apps is making more sense now, and it’ll be interesting to see where things go from here. Galactus has come to the planet Newhaven, home to the last survivors of millions of worlds destroyed by the Eater of Worlds. 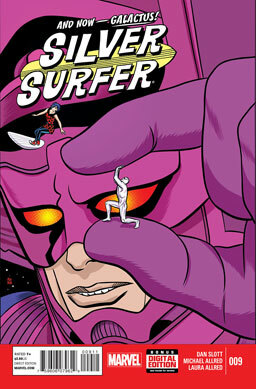 Rejected by Dawn, the Surfer heads out to stop Galactus — by surfing the planet’s moon into his face! That gets Galactus’ attention, but he reacts by stripping the Surfer of his cosmic powers, leaving him powerless and adrift in space. Can anyone stop Galactus now? Verdict: Thumbs up. Outstanding art, as always, from Mike and Laura Allred. Big ups for Dan Slott’s story, too — surfing a whole moon is pretty inspired, even if it’d pretty obviously be something Galactus would shrug off. I’m assuming Norrin will get re-powered next issue — but with this comic, who knows? 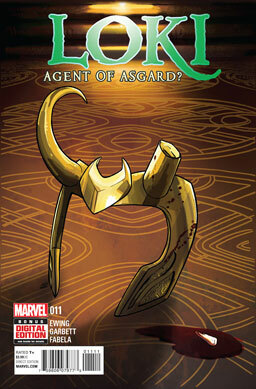 Everyone in Asgard is mad at Loki. Loki is very depressed. Old King Future Loki is very mean. Verdict: Thumbs down. Just a bit too overdone on the woe-is-me stuff. The God of Lies is in a thoroughly uncomfortable predicament — he’s no longer able to tell any sort of lies. So of course, Thor — or the Odinson, as he prefers to be called, now that he’s no longer worthy to carry Mjolnir — picks this moment to request a visit. And Loki spills the truth he’s been keeping hidden — he’s not really the proper Loki — he’s a spirit-copy of Loki who managed to destroy and devour the old Kid Loki, taking his place and accidentally acquiring his desire for redemption. But Thor is deeply unhappy to hear that his real brother is basically dead, and he delivers a beatdown, then drags Loki back to Asgard to face punishment. Can the trickster talk his way out of this one? Verdict: Thumbs up. This has been coming for quite a while, and it’s a credit to the storytelling that it’s as massively painful and traumatic to Loki as it should be. 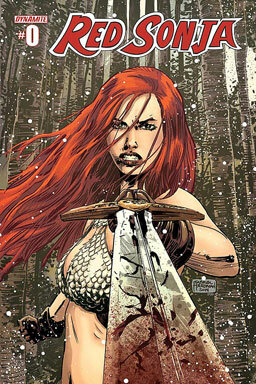 Sonja has been cursed to never forgive any slight, no matter how insignificant. She’s being stalked by the brother of the wizard she destroyed, and is herself stalking a man named Fellan, who is the last remaining brigand who slaughtered her village in her youth. When she finally finds him, he begs her to forgive him, which, again, isn’t in the cards. She easily destroys his henchmen, but Fellan makes his escape. Realizing that the curse she’s under makes her a danger to everyone she meets, Sonja needs to figure out how to keep herself from becoming a remorseless, soulless slaughterer. Verdict: Thumbs up. It’s a grimmer story than probably any of the previous storyarcs, but it’s beautifully told and beautifully illustrated — definitely worth checking out. Here’s a list of some great roleplaying games — many of which are almost certainly new to you. Wikipedia has come out in favor of the violent hatemongers of Gamergate. Maybe we should remember that next time they come begging for money in their multi-annual fundraisers. 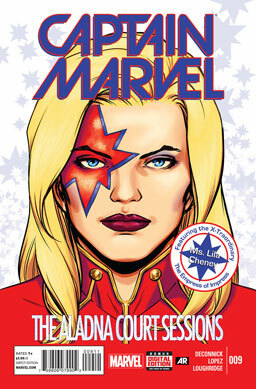 Captain Marvel and Tic are traveling through the galaxy when they unexpectedly meet up with mutant teleporting rock superstar Lila Cheney! She reveals a particularly weird problem she has — she’s supposed to marry a prince on a world where everyone rhymes, and she doesn’t really want to get hitched. So Carol and Tic have to figure out a way to keep Lila away from the altar. Can she handle fighting off a jealous suitor? Can she keep this rhyming gig going all the way through? Will there be a surprise wedding after all? Verdict: Thumbs up. Fun story, fantastic and charismatic art — David Lopez has a very strong talent for great facial expressions — and perfectly servicible rhymes. It’s a fun and funny break, and the sort of thing that’s always enjoyable in a superhero comic. Sonja tracks down and executes a murderous sorcerer, but not before he hits her with a terrible curse, depriving her of the ability to ever forgive anyone of any slight, no matter how small. That means she ends up unleashing on everyone she comes across — and her newly boundless rage even costs her the opportunity to destroy the only marauder who escaped her vengeance after the destruction of her home village. Verdict: Thumbs up. This has been a gloriously fun storyarc — one of the best of the year. 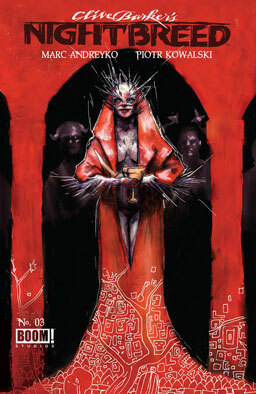 If you haven’t read it before, you should definitely watch for the collected edition. Don’t let the often-exploitative Dynamite name on the cover throw you off — this is definitely one worth reading. Verdict: Thumbs up. 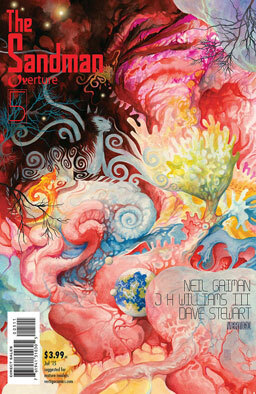 Larime Taylor’s art is still fantastic, with a bit of a change in appearance as Jay Savage is now working the colors. Besides that, very nice dialogue and a nice trick of making these two nutcases so dang charismatic and loveable. DC is backing off on these awful shirts now, but this happens often enough that I’m starting to think they’re doing it just for the sake of the scandal publicity. The International Space Station has cooked up an amazing tribute to Douglas Adams. Neil Gaiman writes a great essay on Terry Pratchett. 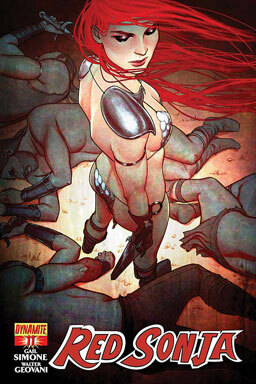 Red Sonja is dead! And left behind is her beloved… husband? 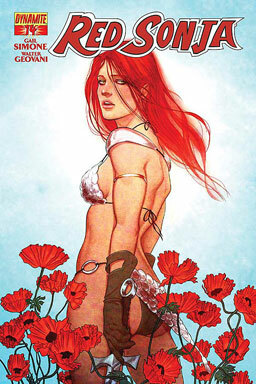 Red Malak is a tubby loser who insists Sonja was a delicate princess who loved pretty dresses and flowers. Of course, Sonja soon turns up, very much alive, very much not a delicate princess, and has to deal with the lovesick conman who’s slandered her — and the townspeople who think she’ll pay for his debts. Verdict: Thumbs up. 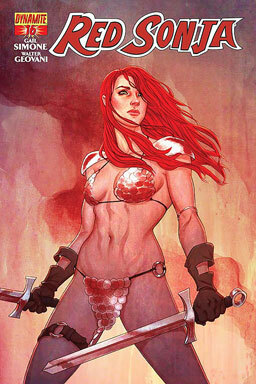 A nicely light-hearted story that still has all the action, mayhem, and general crudity you love in Gail Simone’s Red Sonja stories. In this latest issue of the anthology series, the seemingly demonic Chocolat must protect her hatchlings in 15th century Italy, while during the Summer of Love in San Francisco, a very young Rev. Ashberry learns of the dangers of temptation. Verdict: Thumbs up. Pretty well-done storytelling — and nicely themed, too, as we get twin studies on the natures of good hiding within apparent evil, and evil hiding out within the appearance of good.